Growing up in a town between Princeton and Trenton, New Jersey, I was exposed to a diverse population — both racially and economically. And while I am grateful I grew up in a place that encouraged a progressive mind-set, this naturally precluded conservative views. A lot of people in my town thought this was a good thing — in fact, I distinctly remember a conversation in my high school AP Government class in which the only conservative male was labeled a racist and sexist by 25 liberal females, simply for expressing his thoughts on what it means to be self-made man. But after hearing Arizona Republican Senator Jeff Flake’s resignation speech Oct. 24, I realized being exposed to both sides of the political argument can have its merits — and sometimes, going against major parties is the only way to be heard. Blind accusations — such as those made against my male classmate and against President Donald Trump every day — are more common since the 2016 election. Not only is the media remarkably biased and critical of every action the president takes, the criticism has reached a low point where even average Republican voters are assumed to be racist and misogynistic by association. The Washington Post recently dedicated an entire article to mocking Melania Trump’s decision to wear heels — a story without any political merit, and just one example of the media using meaningless details as an excuse to publish a story against the president. But one Republican spoke out enthusiastically against Trump since the beginning — Flake. In his resignation speech, he not only expressed distaste for the president but tried to speak on behalf of the general public, which he feels is not properly represented by the current administration’s values. “The personal attacks, the threats against principles, freedoms and institution, the flagrant disregard for truth and decency,” Flake said, “[have] nothing whatsoever to do with the fortunes of the people that we have been elected to serve”. And Flake thinks the problem isn’t just the current administration’s values — he seems to think the entire party has changed. “I don’t think we ought to normalize this kind of behavior,” he said. When CNN reporter Jake Tapper later asked Flake to clarify what kind of behaviors he was referring to, he admitted he felt his responsibility to speak up developed throughout Trump’s presidential campaign. He specifically noted when Trump referred to Mexicans as rapists and criticized a judge because of his Mexican ancestry. He also mentioned when Trump said he couldn’t refer to Sen. John McCain, R-Ariz., as a war hero because he was captured. Flake said his final breaking point was when Trump condoned sexual assault in the now-infamous “Access Hollywood” tape. These are all examples of preposterous presidential behavior — and while Trump was critiqued by many, such as former Massachusetts Gov. Mitt Romney and McCain, during the campaign, few Republican politicians have spoken up since. Perhaps it’s fear of retribution, or maybe the party has simply changed — either way, Flake couldn’t take it any longer. But his audacious speech received mixed reviews from those who questioned whether it was genuine or merely an act to receive attention before losing an election. “Based on previous statements and certainly based on the lack of support that he has from the people of Arizona, it’s probably a good move,” White House Press Secretary Sarah Huckabee Sanders said, referring to Flake’s decision to not seek re-election. She might have a point — Flake’s disparagingly low approval rate of 18 percent makes his chances of winning re-election close to impossible. But Flake’s approval ratings weren’t necessarily this low because of poor performance in office. In fact, the ratings are a direct result of his strong and vocal disapproval for Trump during the campaign, which he has been bold enough to express for the last two years. And this outrage is completely surprising, considering Flake’s legacy and own potential in politics. Flake’s family has been involved in shaping America for generations — his great grandfather, William J. Flake, was such an impactful figure in Flake’s hometown of Snowflake, Arizona, that the town was named after him. 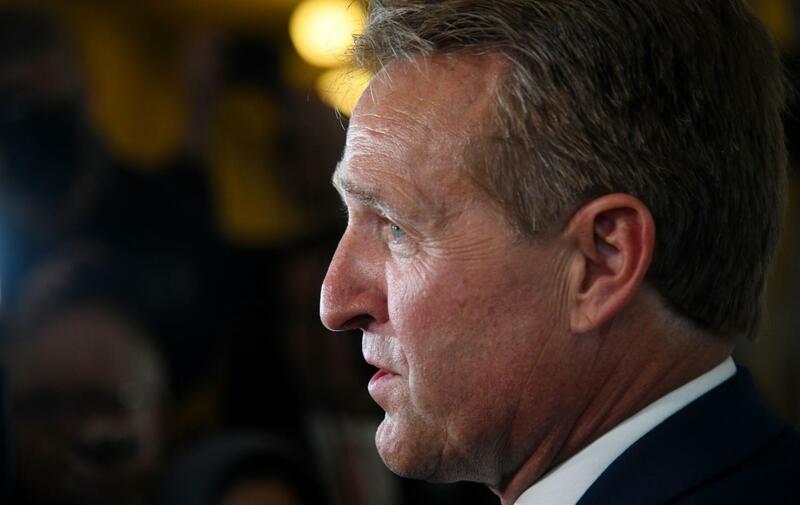 “I’m aware that there’s a segment of my party that believes that anything short of complete and unquestioning loyalty to a president who belongs to my party is unacceptable and suspect,” Flake said. Speaking out consistently against the Republican leader of the country was near-certain political suicide that Flake knew he was committing — and it had the potential of destroying a legacy that he carried for generations. “He’s what I would call a real conservative”, Sen. Bob Corker, R-Tenn., said about Flake. Of course people will call Flake’s motives into question — but while there’s no way of knowing definitively whether he was genuine or not, his speech should still serve as a wake up call to both Republicans supporting Trump and Democrats who assume all Republicans are the same.